In ecological and epidemiological modeling, survey data are usually collected at sampling sites and then regionalized in Geographical Information Systems (GIS). To enhance spatial data densities, continuous field data such as land surface temperatures (LST), snow coverage, and vegetation indices are commonly derived from satellite data. The launches of the new satellite systems Terra (December 1999) and Aqua (May 2002) significantly improve the situation of data availability for scientific purposes and predictive epidemiological studies. The Moderate Resolution Imaging Spectroradiometer (MODIS) is a key instrument on both Terra and Aqua satellites. As they deliver daily two global coverages at 250m (Red, NIR), 500m (MIR) and 1000m resolution (TIR), they are most interesting to support epidemiological studies. Usually one week after acquisition the data are available to the public. A. Rizzoli, M. Neteler, R. Rosà, W. Versini, A. Cristofolini, M. Bregoli, A. Buckley, E.A. Gould, 2007: Early detection of TBEv spatial distribution and activity in the Province of Trento assessed using serological and remotely-sensed climatic data. Geospatial Health, 1(2):169-176. M. Neteler, A. Rizzoli, R. Rosà, 2006: Enhancing spatial disease mapping through new satellite sensors: tick-borne Encephalitis in Trentino, Italy. 1st OIE International Conference: Use of GIS in Veterinary activities, Section: Data collection and Remote Sensing applications, 8-11 Oct., Silvi Marina (TE), Italy. M. Neteler, 2005. Time series processing of MODIS satellite data for landscape epidemiological applications. International Journal of Geoinformatics. Special Issue on FOSS/GRASS 2004 & GIS-IDEAS 2004, 1(1), pp. 133-138, March 2005. S. Endrizzi, G. Bertoldi, M. Neteler, and R. Rigon, 2005. Reproduction of snow melting spatial patterns with the hydrologic model GEOtop. 2nd EGU General Assembly. Poster. In European Geophysical Union, Geophysical Research Abstracts; Vienna, Austria, 24-29 April 2005. M. Neteler, 2004. MODIS time series remote sensing for epidemiological modeling. In Proc. GeoInformatics for Spatial-Infrastructure Development in Earth & Allied Sciences: GIS-IDEAS. 2004, Sept. 16-18, Hanoi, Vietnam, 2004. 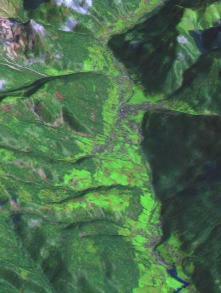 See also: Collection 5 Land Reprocessing Plan and MODIS Land Collection 5 Changes. M. Neteler, 2005. SRTM and VMAP0 data in OGR and GRASS. GRASS Newsletter, Vol.3, pp 2-6, June 2005. ICESat (Ice, Cloud,and land Elevation Satellite) is the satellite mission for measuring ice sheet mass balance, cloud and aerosol heights, as well as land topography and vegetation characteristics. In March 2002, the European Space Agency (ESA) launched Envisat, an advanced polar-orbiting Earth observation satellite which provides measurements of the atmosphere, ocean, land, and ice. One of our mission is to support, enhance and distribute Free Software GIS. In fact, we are exclusively using Free Software/Open Source in our projects as it fits into our vision of transparent research. While hosting and co-developing one of the largest Free Software GIS projects, GRASS, we certainly make use of other related tools to enhance our spatial data toolbox.